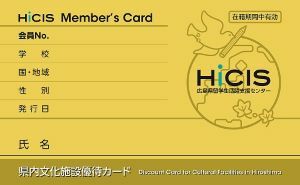 Complimentary entrance to the facilities introduced in this guide has been arranged for you through the joint efforts of the Hiroshima International Center and the establishments themselves. We hope that this service will help you make your stay in Hiroshima even more enjoyable. Please　show your complimentary card and student ID at the entrances of the institutions noted in this publication.Among the cultural facilities listed in this guide are those which contain exhibtions requiring a fee,even for those students holding complimentary cards. Furthermore,there are facilities with limited and or unusua operating months / hours.Please confirm prior to visiting. For details and confirmation,please contact the applicable facility before paying a visit.